Logos were digital before there was digital--quick hits, with immediate impact and lots of message delivered in a tight, clean package. A powerful visual tweet designed “to aid and promote instant public recognition” a good logo can quickly communicate brand, image, backstory, aspirations and propaganda. Inspired by Celtic spirals, which radiate out and are woven together to create a fluid, unified shape. 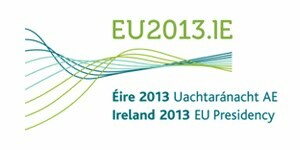 Four spirals have been used to represent the four decades of Ireland’s EU membership. This logo uses customized letterforms to create a modern identity, with rounded letters highlighting the Presidency web address. The different letterforms are meant to communicate a message of diverse countries coming together with common values and objectives. Symbolizes the coming together of different elements to form a working unit, with the left side of overlapping lines creating a grid with 27 boxes representing each Member State. The fluid lines reflect the Irish landscape and coastline while conveying the dynamic nature of modern Irish society. Here's how I saw it--I first liked “Spirals” as being the most “Irish” (and maybe because I use a Celtic spiral design as my own logo.) 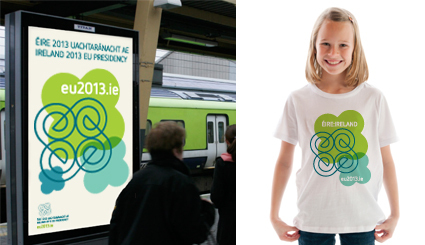 "Wave" communicates Ireland's island nature and rolling hills and has an attractive 3D feel. "Logotype" is of the school of graphic design that eschews geometric logos in favor of a distinctly displayed typeface. I settled on “Connections” as being the most modern, forward looking design, indicating Ireland's position in Europe with a kind of "all roads lead to Ireland " and "Ireland, the Gateway" look. Checking the voting, I see I'm in the minority! 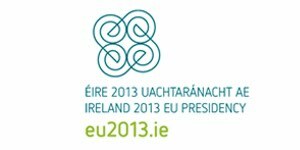 Tánaiste Eamon Gilmore and EU Affairs Minister Lucinda Creighton speak here about the importance of the Presidency for Ireland, and the logo poll. 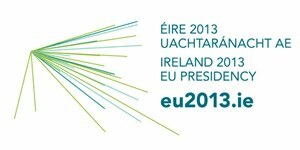 Again, anyone can vote at merrionstreet.ie. 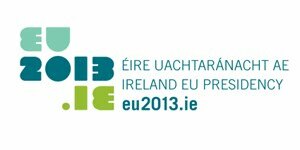 The winning logo will be announced in early January 2012 and be displayed prominently one year later during Ireland’s 2013EU Presidency. UPDATE: Announcement of winning logo has been pushed back to early February. MEDIA PINGS…SiliconRepublic.com reports ten-year-old Irish animation company Kavaleer will create 30 new animation jobs over the course of 2012. The Dublin based studio has been twice nominated for an IFTA, a British Animation Award and has won four Digital Media Awards…DigitalTrends.com reports that according to Ireland-based, research firm StatCounter, Google’s Chrome 15 has overtaken Microsoft’s Internet Explorer 8 in global browser usage during the final week of November 2011…A recent study shows that Ireland has made great progress since 2006 when only half of the Irish population had internet access and just 13 percent had broadband to now when 65 percent of have broadband (though 21 percent of Ireland’s people have never used the internet)...OK, enough with the digital--the next Irish American Writers & Artists Salons is Tues., Dec. 20, starting at 7pm at The Cell . Enjoy a night filled with music, a short staged play, poetry, a Celtic Christmas tune or two, storytelling and readings (rumor has it the Salon may spill over into a local pub afterwards for some holiday cheer).